Acid Worlds are rich in common minerals, with heavy deposits of formic, hydrochloric, hydrocyanic, nitric, phosphoric, and sulfuric acids and a small number also support life. These worlds are typically a low danger but low yield option for mining. Alkali Worlds are rich in alkali base metals, with medium deposits of strontium, barium, and calcium. About one quarter support life. In Sol, Titan is an Alkali World. Alkali worlds are a low yield but low danger mining option, though the high chance of life makes investigation worthwhile. Auric Worlds have the equivalent of three huge deposits of gold and nearly 1/3rd of them support life. Despite a fairly high landing cost, these rich worlds always provide a good return and are prime targets for mining operations. Azure Worlds feature light deposits of indium, vanadium, and molybdenum and around one quarter support life. Azure worlds provide a very poor mineral yield whilst dealing with moderate tectonics but can be worth investigating for life. Carbide Worlds are rich in carbon, a common element, with three heavy deposits' worth. These worlds offer extremely low yields for mining operations and rarely contain life. A rare planet type, Chlorine Worlds feature very heavy deposits of both pure chlorine and hydrochloric acids, with light deposits of zinc and trace deposits of gallium. With an average mineral value, high landing cost, dangerous tectonics and almost no chance of life, these worlds are a mediocre at best mining opportunity. Chondrite Worlds feature heavy deposits of ethanol and free radicals. With dangerous tectonics and extremely low RU yield, these usually lifeless worlds are an extremely low value mining opportunity. Cimmerian Worlds have midsize deposits of methane, ammonia, methanol, and lithium. With a poor mineral yield and almost no chance of life, these worlds present a poor (if usuaully safe) prospect for mining. Copper Worlds are made of pure copper, and feature the equivalent of two huge deposits. Copper worlds have a reasonable material yield, a safe environment and nearly one quarter contain life, making for a good mining opportunity. Crimson Worlds feature light deposits of barium, boron, beryllium, bismuth, and bromine. Although this world type contains only a moderate mineral yield, a good number can contain life and usually have a safe environment though care should be taken to check weather conditions which may sometimes be much higher than normal. 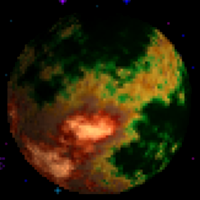 Cyanic Worlds appear green from space, and have dark green surfaces. They usually have huge quantities of Cyano-acetylene. In Sol, Ganymede is a Cyanic World. Dust Worlds have light deposits of bismuth, aluminum, and potassium. They appear red from space and have a dark red surface with blotches of pink and brown. Their surface is composed of silicate and metal oxides. Their thin atmosphere occasionally supports minimal ecosystems. Mars, in the Sol system, is a Dust World, as is the Druuge homeworld. 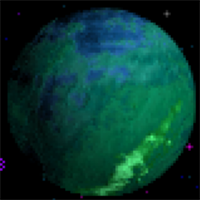 Emerald Worlds appear green from space, and have bright green crystal-patterned surfaces. They are rich in exotic minerals, with medium deposits of antimatter and huge deposits of Aguuti nodules. Fluorescent Worlds have huge quantities of technetium and neon, and light quantities of radon. They appear violet from space. Gas Giants get their name from the fact that they are incredibly large planets composed of gases. Because they are made of gas, The Flagship cannot land on them or collect minerals from them (though there has been some discussion regarding the harvesting of the upper atmospheric layers of such planets with immense "scoop-ships"). They do, however, often have many moons. The only known instance of intelligent life evolving inside a Gas Giant are the Slylandro. Gas giants come in a variety of colors, and feature a distinctive striped pattern visible from orbit. In the Sol system, Jupiter, Saturn, Uranus and Neptune are Gas Giants. Moons are never Gas Giants. Green Worlds have heavy deposits of praseodymium and neodymium. They also can support life. They of course appear green from space, and have a heavily-cratered teal-green surface. Halide Worlds feature medium deposits of the corrosive halide elements bromine (two deposits), fluorine, and iodine, and the radioactive halide astatine. Some can support life. They appear green from space and their surface is teal, green, brown, and grey. In Sol, Europa is a Halide World. Hydrocarbon Worlds are planets with huge deposits of hydrocarbons (considered common) and have light quantaties of the base metal tantalum and trace amounts of bismuth. They often support life. 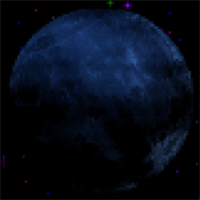 They appear blue from space, with a dark blue and dark violet surface. Effectively, they are Water Worlds with hydrocarbon compounds instead of water. Infrared Worlds feature large deposits of mercury. They appear red from space and have a light brown and red surface. They can support life. Iodine Worlds feature some base metals and corrosive elements, especially Iodine. They appear green from space and have a heavily-cratered yellow-green surface. Lanthanide Worlds are worlds composed of the heavy rare earth elements. They are rich in elements like ytterbium, cerium, and lanthanum. They appear yellow from space and have high tectonics. Magma Worlds are worlds with a very thin crust, and experience extremely frequent earthquakes as a result of the motion of the mantle. They normally have a moderate amount of base metals, and appear as large red planets from space. Magnetic Worlds have ferromagnetic metals, especially nickel and niobium, and a small amount of exotic magnetic monopoles. They appear green from space and have a brown-green surface. Their strong magnetic fields cause the manifestation of vicious lightning storms. Maroon Worlds have base metals and common minerals. They appear red from space, and have a heavily-cratered red-violet surface. Metal Worlds or Metallic Worlds are rich in all sorts of metals, including precious metals, corrosives, and base metals. When they are hot enough, they appear red-orange from space, and have a heavily-cratered yellow and orange surface. If they are not so hot, they appear gray from space, with a shiny cratered gray surface. In Sol, Mercury is a Metal World. Usually found in the first or second orbital position, these worlds are the cores of burnt planets, occasionally having a dangerously high gravity, and usually prone to lightning storms. They may support a few lifeforms. Noble Worlds are rich in noble gases, sometimes also having small deposits of common Helium. They appear blue from space, with a dark blue surface covered in large blotches of light blue.May sometimes support life. Oolite Worlds have moderate deposits of rare earth metals as well as small levels of precious metals. 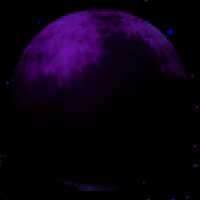 They appear purple from space and a cratered, purple and violet surface is revealed in orbit. 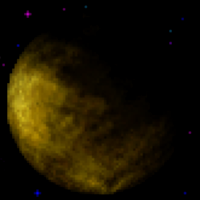 The Oolite World closest to Sol is Alpha Ptolemae VI. Opalescent Worlds feature rare earth metals, noble gases, and base metals. They appear cyan from space, and have a sea-green surface. Organic Worlds feature organic compounds, common minerals like carbon dioxide, formaldehyde, and free radicals. While these sort of chemicals are related to life, there may or may not be alien life forms on an Organic world. Organic worlds appear cyan from space. Pellucid Worlds are less opaque than most, and usually have very small amounts of exotic minerals, typically Tzo Crystals, if any minerals at all. They appear violet from space, with pastel violets and blues on the surface. In Sol, Pluto and Callisto are Pellucid worlds. Plutonic Worlds are geologically active, but have little volcanism. Therefore, most rocks there formed deep beneath the crust, and frequently contain large deposits of base, rare earth, and radioactive metals. These uncommon worlds are large and yellow, when viewed from space, and have orange-yellow, red, and brown surfaces. Primordial Worlds have common minerals and base metals. They appear green from space and their surface is many shades of green. These planets are large and rocky, composed of a core of metal and a crust of silicate. Their atmosphere is composed of a super-thick layer of carbon dioxide at extremely hot temperatures. In Sol, Venus is a Primordial World. The Ilwrath homeworld is also a Primordial World. Purple Worlds have some base metals. They appear violet from space with a heavily-cratered purple surface. Quasi-Degenerate Worlds often have some exotic Degenerate Matter. They appear green from space and have a dark-green surface. Radioactive Worlds possess good deals of radioactive minerals. Although they give a nice reward, they are fairly hard to find. They appear bright orange from space, and have a brilliant pink and orange surface. The radioactive substances are either the result of an atypical gas composition of the atmosphere or unusual mantle convection processes. In Sol, Io is a Radioactive World. Rainbow Worlds are "worlds whose radiant energies defy all scanners producing a rainbow-like image". Redux Worlds or Reduction Worlds have base metals and corrosive minerals like Oxygen, Chlorine, and Sulfur. They appear green from space, and have a very dark green surface with medium pale brown splotches. The atmosphere of these planets consists of methane and ammonia rather than oxygen. The VUX, Zoq-Fot-Pik and Burvixese homeworlds are Redux Worlds. 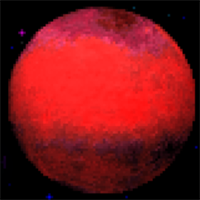 Ruby Worlds are a very rare type of planet, covered with the coveted exotic minerals, especially Neutronium and Tzo Crystals. Two prominent Ruby Worlds have a hellish surface temperature and lack an atmosphere. They appear red from space, and have a crystal-patterned surface visible from orbit. Sapphire Worlds appear cyan from space, and have bright blue crystal-patterned surfaces. They are rich in exotic minerals, such as Super Fluids and Reisburg Helices. The Chenjesu/Chmmr homeworld is a Sapphire World. Selenic Worlds are similar in most respects to our moon, and feature base metals like Selenium, Calcium, and Aluminum. They appear grey from space and have a heavily cratered grey surface. In Sol, Luna is a Selenic world. Shattered are former Water or Telluric Worlds that had their crusts shattered by the Mycon Deep Children. They appear orange from space, and have black surfaces with orange lava rivers across it. They usually have very large quantities of base metals, precious and radioactive minerals, but also have very hostile tectonic conditions, often close to class 8. All of the known Shattered Worlds are located in Mycon space. Super-Dense Worlds, as their name implies, feature very dense base metals such as Lead. Their high density causes seismic instability and heavy gravity, making them dangerous and expensive to land on. They appear violet from space and have a dark violet and dark teal surface. Telluric Worlds have precious and base metals. They can support life. They appear blue from space but have a white, brown, and pale blue surface, looking very similar to Water Worlds. Eta Vulpeculae II, the adopted homeworld of the Androsynth, is a Telluric World. As is the Umgah homeworld. Treasure Worlds are rich in precious minerals like Gold and Silver. They appear yellow from space with a somewhat shiny gray surface with golden patches. Ultramarine Worlds are rich in rare earth minerals like Holmium, and sometimes feature life. They appear blue from space, and very dark blue from orbit, with a cratered surface. Ultraviolet Worlds have high concentrations of precious metals, moderate levels of corrosives and common elements, and trace amounts of base metals. They appear violet from space and have purple and violet surface features when viewed from orbit. One such world can be found at the first planet of the Gamma Centauri system. Urea Worlds have some common minerals like Ammonia, and can support life. They appear yellow from space, and have a heavily cratered, dull golden surface. Vinylogous Worlds have base metals and common minerals. They appear violet from space and have a dull lavender surface. In Sol, Triton is a Vinylogous World. Water Worlds are planetary bodies in which the majority of the surface is covered in water (or ice or vapours). They are uncommon in the galaxy. When found within more moderate orbits, however, they have a higher chance of having life evolve on them. Many of the advanced races' homeworlds are water worlds, including Earth, Spathiwa, and Gaia. The Mycon favor these planets as targets for their Deep Children, who transform them into Shattered Worlds. 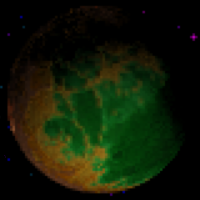 Water worlds typically are rich in base metals, though rare deposits of radioactive and corrosive metals can sometimes be found on the more degenerate water worlds. They appear blue from space with a dark blue (cold) or blue (moderate temperature) or maroon (high temperature, e. g. Zeta Volantis IV) surface with white clouds and brown/yellow land masses. Xenolithic Worlds have scattered deposits of precious metals with trace amounts of base metals. They appear cyan from space and have a teal and grey surface when viewed from orbit. One such world is Delta Centauri II. Yttric Worlds are worlds composed of Yttrium and Ytterbium. They hold rare earth metals and base metals. They appear violet from space and and have a lavender surface with dull cyan splotches. 1This comes from Star Control II fact #6 - Small trivia. The one exception to this rule is the Neptune's moon Triton, which is a large rocky world. This page was last edited on 26 September 2017, at 16:50.